Even though we are technically in winter, Jacksonville residents are still able to si t out in the backyard and enjoy the beautiful weather. Now is the perfect time to design your dream backyard. There are endless possibilities to your outdoor living dreams and we at C & L Landscape would love to help make those dreams come true. We would like to talk about some of the backyard ideas that we can design to make your backyard your favorite room in the house. Pavers are a great way to spice up your backyard. They can be designed into beautiful shapes and come in all kinds of colors. They are easy to maintain and hardly ever need to be replaced. Not to mention, they are also much cheaper than laying a concrete patio or installing a deck. In case you aren’t familiar with this term, pergolas are arbor-like structures that act like a cover to part of your patio. Although they do not protect you from the rain, these structures add a touch of class and elegance to your backyard while offering some shade. Pergolas can be painted but leaving the wood exposed looks just as nice. When you are creating an outdoor space where you can sit and enjoy the day, you may never want to leave. Adding a kitchen with a sink and a grill will be a great help when you are entertaining on the patio on those warm summer nights. A outdoor fireplace is also a great addition so that you don’t have to leave your favorite spot when the nights start to cool down. 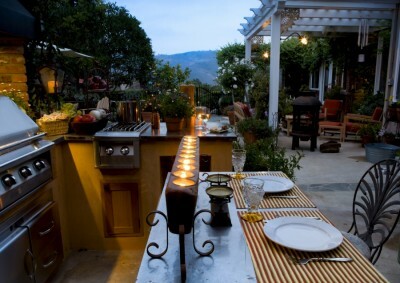 We have thought of everything you need to create your backyard space. When you are ready to make your plans a reality, call C & L Landscape and let us help you make your landscaping dreams come true.